This is the last episode in this season’s series, The VPR Table. Marialisa Calta takes us on a journey to the cold land of mystery commonly known as the freezer. Don’t be fooled by appearances. That gallon jug of what looks like cider could be a last winter’s venison broth. 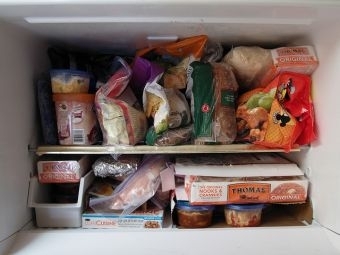 Share your freezer revelations and tune in next week for "The Vermont Garden Journal" with Charlie Nardozzi. that I froze in 2006. It tasted like I imagine Styrofoam tastes. The larder seems empty, but the freezer is still half full of stuff. Odd stuff. of goat meat – from who? From when? Cottage cheese that I bought by mistake. label them clearly with contents AND date. will eat this stuff, no matter how bad it looks. Or tastes. stewed up a beef ragout, but it might well have been venison, not that we care. it’s white, wheat or rye. make that shrimp taste palatable. that no one in my family likes rhubarb, except me. The freezer will be ready. On this week’s VPR Table, we’ll explore Vermont’s rural sugaring tradition.